Throughout history, some books have changed the world. They have transformed the way we see ourselves - and each other. They have inspired debate, dissent, war and revolution. They have enlightened, outraged, provoked and comforted. They have enriched lives - and destroyed them. Now Penguin brings you the works of the great thinkers, pioneers, radicals and visionaries whose ideas shook civilization and helped make us who we are. 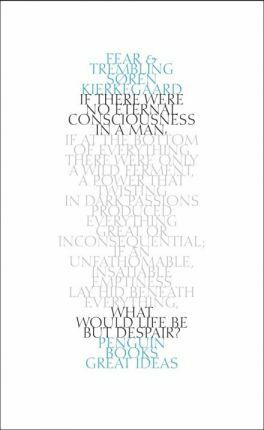 The Father of Existentialism, Kierkegaard transformed philosophy with his conviction that we must all create our own nature; in this great work of religious anxiety, he argues that a true understanding of God can only be attained by making a personal 'leap of faith'. Soren Kierkegaard's childhood was clouded by the religious fervour of his father. Studying both theology and the liberal arts, he began to criticize the Christianity upheld by his father and look for a new set of values. He wrote no fewer than twelve major philosophical essays and his work inspires both modern Protestant theology and existentialism. In his own time, he died an object of public ridicule and scorn.